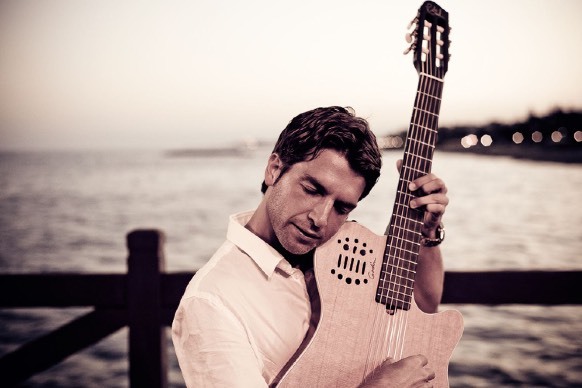 with flamenco, giving to his music an special and unique identity. for party and events entertainment. We are delighted to recommend Jesus, as he is greatly talented and versatile Guitarist & Vocalist soloist and also band leader of Almoraima Fusion Band .He is professional and has incredible musicianship skills. “I love playing the guitar for lovers. For me, it´s a pride to be able to play on such a special day as your Wedding. I enjoy bringing my artistic sensibility during the ceremony, helping to create a unique and unrepeatable moment. And after, during the cocktail, I can create the necessary atmosphere for your celebration, mixing flamenco or classic guitar, with well-known international ballads. I work in the area of the Costa del Sol (Málaga) with several wedding planners, leaving both them and their clients always very satisfied with my performance”. Songs like A Thousand Years (Christina Perri), When a man loves a woman (Joe Cocker), Magic (Coldplay). 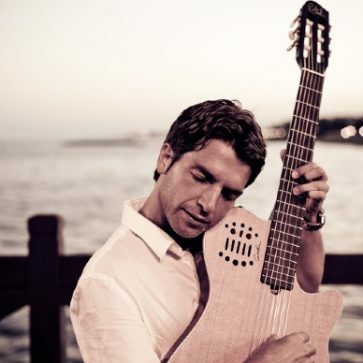 Without a doubt, my greatest quality is to be able to play different styles, being able to give flamenco nuances to internationally known themes, to give them the flavour of Málaga land”.A complete repertoire with different styles like flamenco, pop, jazz… to offer you several options for your event. I am looking for a price for a Spanish guitarist to play during the cocktail and meal for a celebration on July 12th in Marbella. It would be from 8.30 to 10.30.